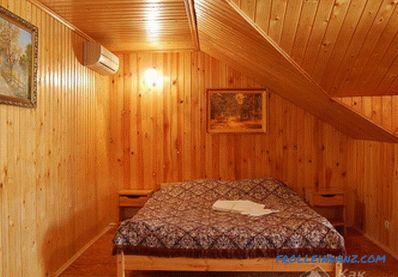 Different materials are used for interior decoration. But, despite all modern developments, popularity of lining does not decrease. This material has many advantages. 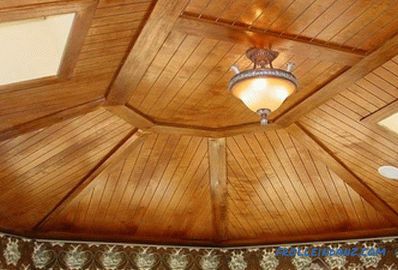 This is the ease of installation, and the beauty of natural wood, and low cost. With the help of lining, you can arrange different surfaces. 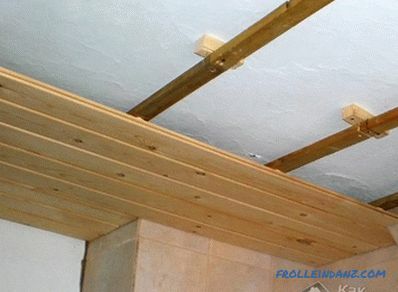 In this article we will talk about how to fix the wall paneling to the ceiling, what are the nuances and difficulties. It is worth talking about some preparatory work. The first thing you need to decide on the direction of finishing. 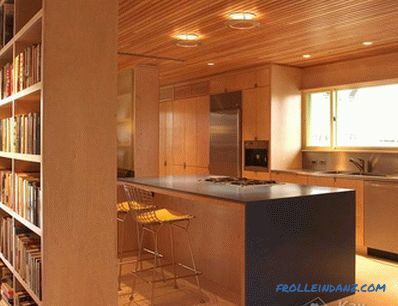 The paneling can be laid along or across the long wall. From this will depend on the appearance of your ceiling. Here the choice depends entirely on your taste. To decide, you can see the photo at the end of the article. The next step is to prepare the wall panel itself. 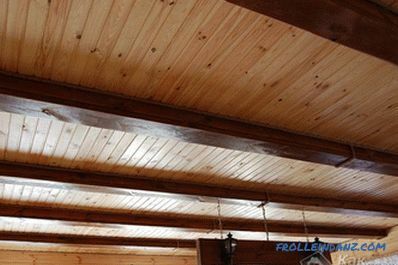 This material is made of wood, therefore, it must be protected from moisture penetration, the appearance of fungi and various insects. For this, various impregnations are used. Each rail must be covered with this tool from all sides and allowed to dry. 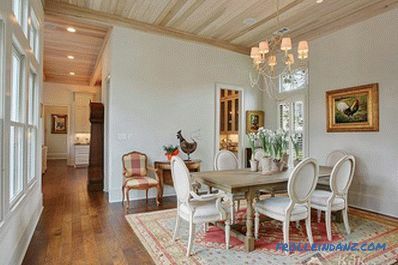 Remove all decorative elements (chandelier, lighting, etc.). Inspect the condition of the ceiling. 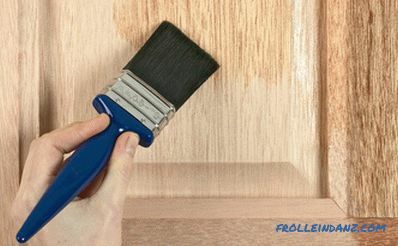 If you find fragile areas of plaster or whitewash, you need to get rid of them. 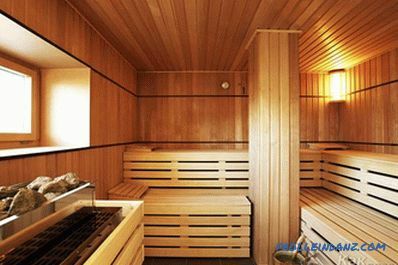 It is advisable to treat the entire surface with an anti-mold agent. You also need to stock up on a stepladder or table so that you can comfortably reach the ceiling. 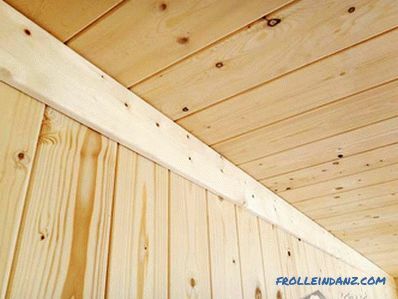 The first thing you should tell about how to make the ceiling of the wall paneling is the installation of the batten. Without such a design you can hardly manage. 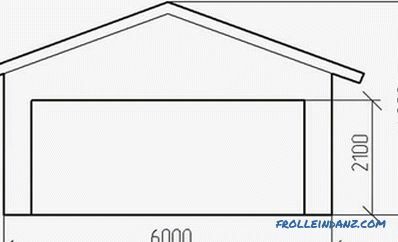 The crate is a frame of rails or profiles, mounted on the ceiling. It is to her that you will mount the wall paneling. First, markup is done. 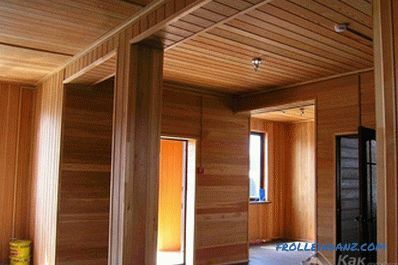 It is necessary to take into account the directivity of laying the wall panel itself, the slats or sheathing profiles should lie across. Do not forget to use the level. The crate should be as even as possible. Otherwise, the lining can skew. The distance between the slats will depend on the features of the ceiling itself and some other factors. For example, if you need to make any communication, then in this place you need to leave more space. 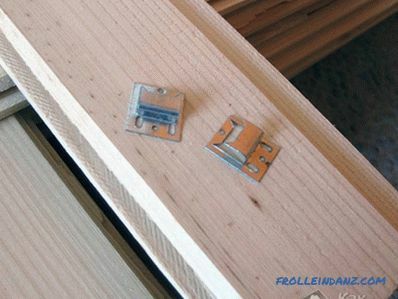 You can also put a layer of insulation (if you want to insulate the ceiling), in this case the distance between the profiles should be at least 45 cm. You can use either wooden slats or profiles to create the battens. The latter type of material is preferred. The profile is not rot-prone and does not deform over time. 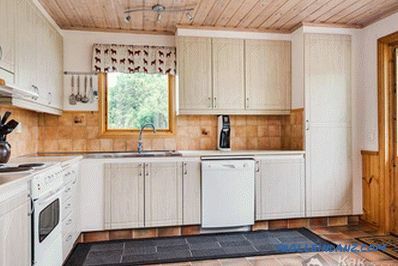 But its price is higher than that of wooden slats, so the choice will depend on your financial capabilities. After the crate is installed, you should think about future communications. If they are planned, they should be put on their seats before the installation of the wall paneling. 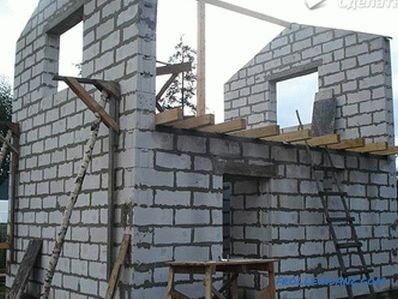 Before installing the wall panel, you should check the functionality of the laid communications, the reliability of their attachment and insulation strength. Lay the thermal insulation layer, if any. 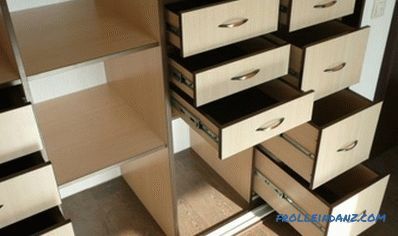 After that, you can proceed to the installation of finishing materials. 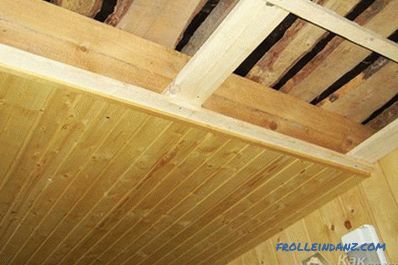 The installation of clapboard on the ceiling is the same as for the vertical plane. 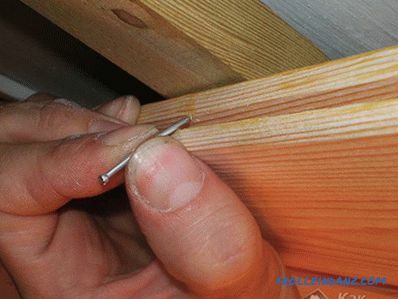 To do this, use a screwdriver and screws (you can also use furniture nails with a small hat). You will definitely need an assistant. Keeping the rail in the right place by yourself will be very problematic. The very first panel is mounted flush with the wall in the corner farthest from the door . Then from her fit the remaining rails. 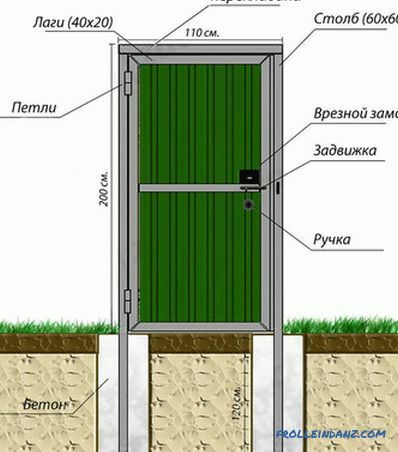 It must be ensured that no gaps are formed during the installation, so the appearance may suffer greatly. 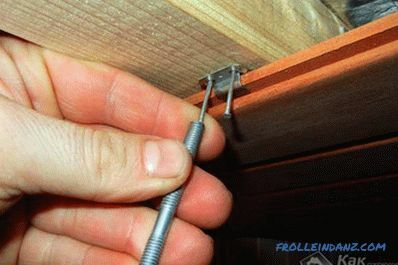 clamps In places where the ceiling light will be installed, it is necessary make a hole in the rail for the output wiring. 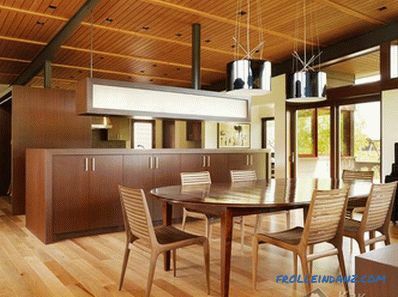 If the chandelier will weigh decently, then it is desirable in this place to attach additional wooden bars to the draft ceiling. 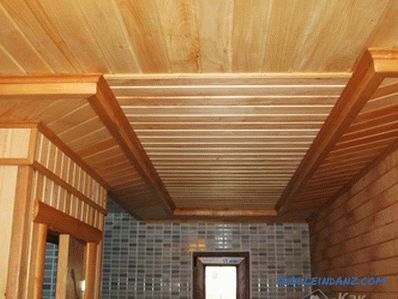 As can be seen from the article, work on the installation of wall paneling on the ceiling is not very different from the wall decoration.If an assistant helps you, then the work will be done qualitatively and in a short time, and the resulting ceiling will delight your eye with the beauty of wood texture and color for many decades. how to hang the chandelier correctly.